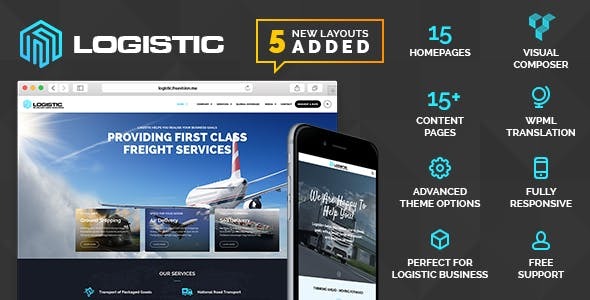 Logistic is Clean professional incredibly powerful & ultra responsive multipurpose Retina Ready WordPress Theme design, that is fully responsive, retina-ready and optimized for any devices, created especially for logistic & transportation companies, offices. You can use in any niche business like a business, cargo, clean, corporate, localization, logistic, modern, multipurpose, parallax, responsive, retina, shipment, trailer, transportation, truck and others. This theme is a highly customizable framework in the backend and to be simple to use, intuitive and powerful, and most importantly results orientated. The theme Easily changes all colours of the Theme (to any colour) in the theme options, It can be easily adapted to any kind of website due to all the features theme has on your blog or website. Custom Page Titles – provides the ability to add different page title contents into the pages.